Last edited by UnlikeUday on Fri Apr 27, 2018 8:49 am, edited 1 time in total. Last edited by UnlikeUday on Sun Apr 29, 2018 3:54 pm, edited 1 time in total. 67 not matter how low scoring that just can't be good. A ridiculously low scoring round this will be. Perez under investigation for misuse of DRS which had to be used manually for this race. Checo's 3rd place is safe Poker. Yeah I've seen now, now I just need a time slot were I can start to post the results, these will appear after dinner. The race saw pole man Vettel lead away from Hamilton and Bottas but further back mayhem ensued with several cars being damaged in separate incidents, the most notable being Ocon not giving Raikkonen enough room as he was being passed and ending up in the barrier and out of the race, Raikkonen himself had to pit for a new nose cone. Another collision was between Alonso and Sirotkin when they were 3 abreast with Hulkenberg who cut across the two of them squeezing Sirotkin into Alonso, Sirotkin retired immediately with left front suspension damage whilst Alonso limped back to the pits with both right hand tyres punctured and then rejoined the race, other cars were damaged as well, all this brought out the safety car. The SC restart saw Vettel pull a gap to Hamilton who seemingly pulled as gap to Bottas, Hamilton was chasing Vettel hard and in doing so he locked up badly which needed a tyre change onto the hardest tyre, after a few laps Vettel did likewise onto the harder tyre, this left Bottas in the lead. Bottas stayed out being able to keep pace on his older but softer tyres, the idea it seemed to pit much later in the race onto the softest tyre from were he would be able to chase down Hamilton and then Vettel. However another safety car was called after teammates Verstappen and Ricciardo crashed into one another, these two had been racing hard against one another throughout the race and it wasn't the first time they had made contact. 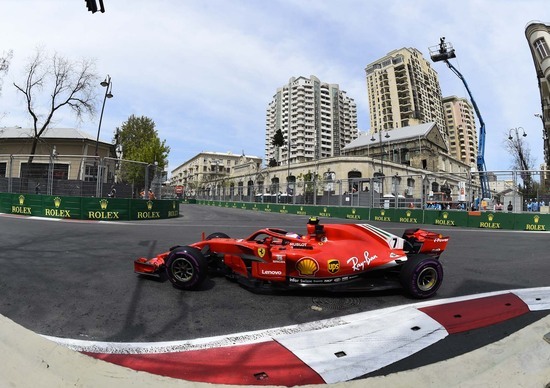 The SC enabled Bottas to pit for fresh tyres and keep his lead, as the cars were being lead through the pitlane to avoid debris on the track both Hamilton and Vettel both also pitted for the softest tyres. At the restart the leaders were almost 3 abreast going into the first corner, Vettel made a dive for the inside locked up and ran wide leaving Bottas in front from Hamilton and Raikkonen followed by Vettel. Going down the straight Bottas ran over some debris that punctured his tyre and put him out of the race whilst Vettel was struggling on his damaged tyres from his lock up which enabled Perez to pass him for third place, the race finished with Hamilton winning from Raikkonen then Perez. In third place with 91 points and receiving the "Podium Perez Trophy"
In second place with 98 points and receiving the "Relieved Raikkonen Trophy"
In first place with 101 points and receiving the "Surprised Hamilton Trophy"
Last edited by pokerman on Sun Apr 29, 2018 8:37 pm, edited 1 time in total. I was looking quite pretty there before the safety car. If Bottas could have gotten pass Vettel on the ultrasofts, I would have gotten maximum points from him, Vettel, Hamilton, Ricciardo and Alonso going by the positions. I watched as it all fell apart. I would just like it be known that I'm not just letting the Mods win to curry favour. That sounds suspiciously much like something someone who is letting the Mods win to curry favour would say! I can assure you that I really am a surprised Hamilton! Worth pointing out that both myself and Tufty managed two podiums today between this and the group pick competition. He beat me in the other one though so we'll be having words.